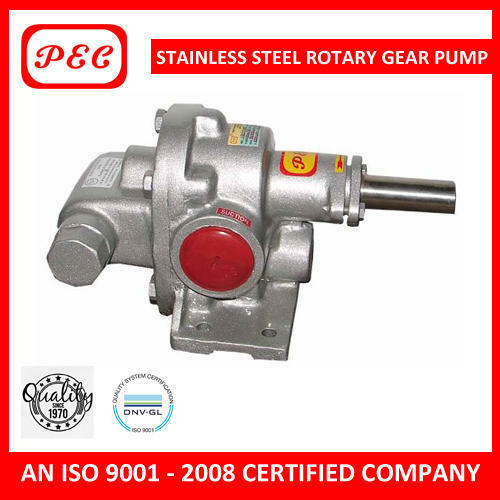 PEC offering Stainless steel Gear Pump. It is also known as Rotary Gear Pump. These Stainless steel Gear Pump or Rotary Gear Pump are multi purpose gear pumps with double helical gears are self priming pump. To Deliver a Veriety of light and viscous liquids such as oil, fats, coal tar, paint molasses. Set up by a visionary and enterprising entrepreneur Mr. N. M. Patel in 1970, the Pump Engineering Co. Pvt. Ltd. (PEC) – has become one of the most leading Pump Manufacturers of India. We are offering our clients a premium quality array of Industrial Pumps, Gear Pumps, Centrifugal Pumps, Hydraulic Test Pumps, Misting Pumps And Systems and High Pressure pump . Maintaining strict adherence to quality under demanding circumstances has led to the stupendous growth of the organization. For the past 4 decades, PEC has witnessed tremendous growth in terms of manpower, R & D and manufacturing & production facilities. The policy of our company is “constant improvement through innovation”. Be it Gear, Centrifugal Pumps, Hydro-test, De-watering, Electric Motors, Boiler Feed or Bulldozer Pumps – PEC has been consistently delivering a high quality range of products that requires no maintenance. We are offering our products under the brand name PEC.